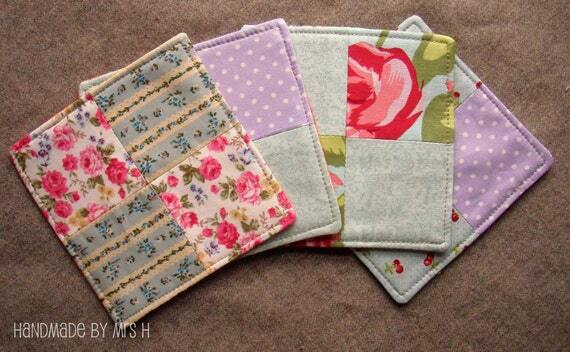 I was meant to post this yesterday cos I was asked how I made my coasters. I let my friend down. But....let's forget about that, it's here today! 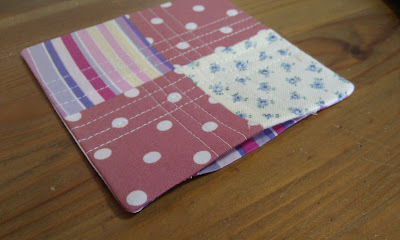 Ok, so a real quickie for you, how I made my patchwork coasters. You know, the ones from scraps? 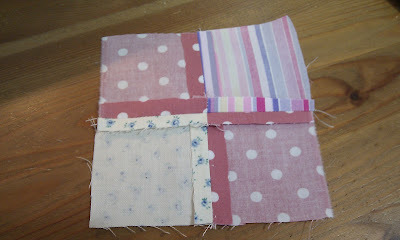 Ok, first I cut out 3" squares from my cotton scraps. 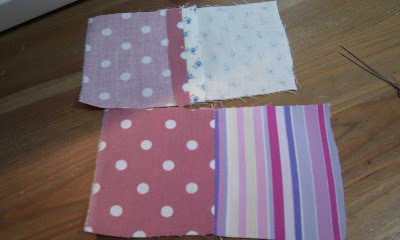 Good quality quilting scraps I have to point out. Miss Mystery says that calling them scrappy coasters makes people think they're not as good as just calling them patchwork coasters. As you can see I chose stripes so if you could just spend the rest of this post pretending that they're straight all of the time that'd be great, thanks. 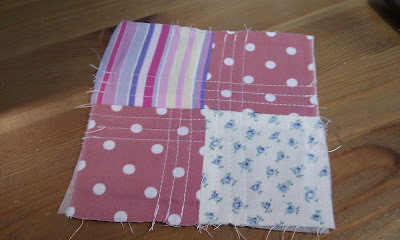 Ok, so take two of your 3" squares and sew them together along one side. Press open the seam. Repeat on the other two. It's important you press open the seams. 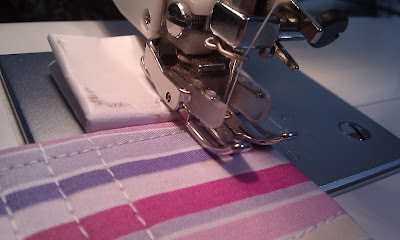 Sloppy work starts with failing to press open your seams. I'm sure there's a printable in that somewhere...anyway, moving on. Then right sides together, sew your two sets of two squares together along one side and press open the seam. If you make these in batches then it makes turning the iron on much more worthwhile. Generally I leave it on when only making one at a time as the energy it uses once up to heat is negligible. (Dus monitors our energy from his desk lol). Anyway, then I pop my square of felt (I'm too cheap for batting) in the centre of the patchwork square then iron my interfacing on top of that. If you don't have interfacing then I suggest you cut your batting to 5" square and baste it to all four edges of the patchwork square. 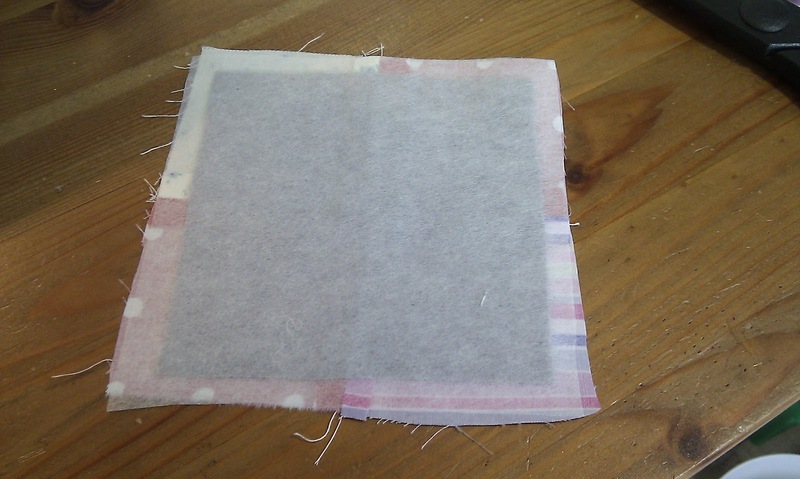 The interfacing just keeps it all together nicely as though it's one piece of fabric. It doesn't matter that I'm using felt, loft batting will also work. Just be careful when pressing that you use a pressing cloth! Anyway, if you want to do any quilting now is the time. 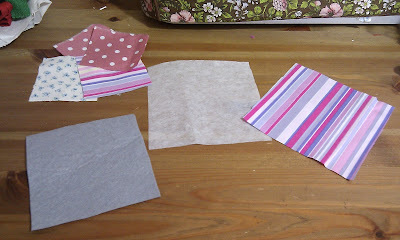 If you don't have interfacing then I suggest doing this step by hand and just a few stitches here and there to give it a tufted appearance. As you can see my quilting skills are somewhat lacking. I almost gave up after the first line cos I hate quilting so much but I persevered for you. I know, you're welcome. 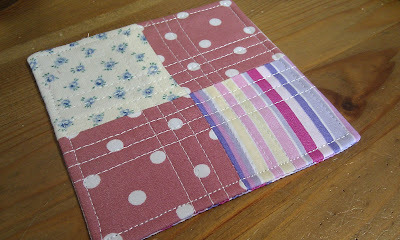 Lay your backing face down on top of your patchwork square and pin around it leaving a gap for turning. I always mark turning gaps with double pins. 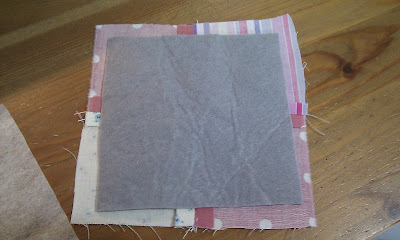 Stitch around the edge with a 1cm seam allowance back stitching at the start and end. Trim your corners and excess seams leaving the turning gap. You'll be thankful you left the extra fabric there. Turn the coaster through to the right side making sure you poke out the corners with a knitting needle or something. This is why we clipped the corners, it helps them to be pointy when turned out. Press the coaster tucking in the turning gap. Top stitch around the outside near to the edge starting just before the turning gap and going all the way around. 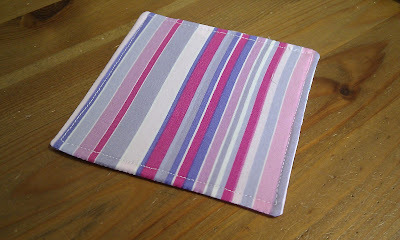 If you're a fan of decorative stitches then go crazy and get that coaster pretty! 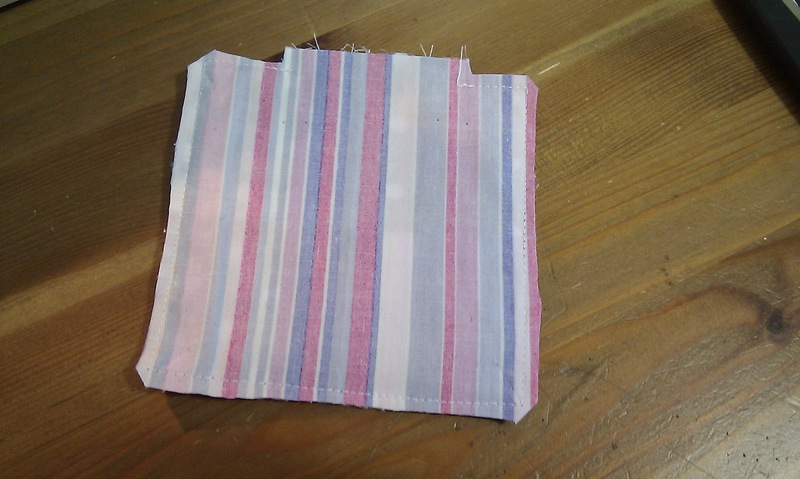 TIP: When you come to the corners, leaving your needle in the fabric, lift up your presser foot and turn your fabric until you're facing the right way. Now BEFORE you put your foot back down, insert a wodge of folded paper under the back of the foot. 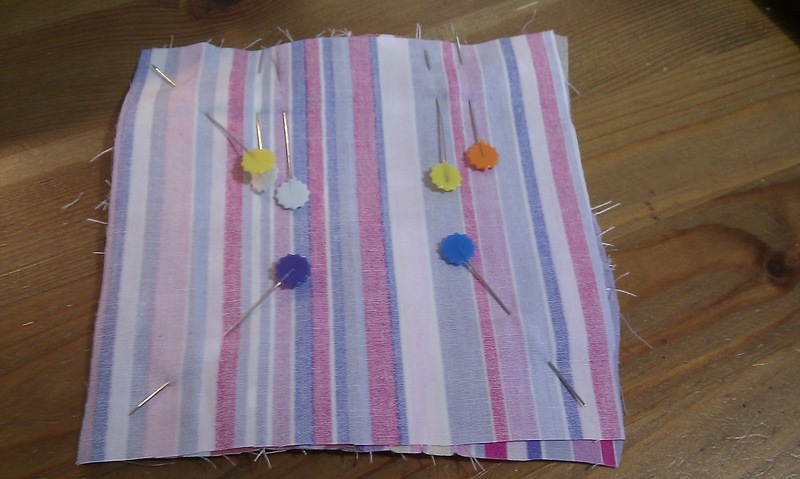 This will keep your foot level when sewing out of the corner and you won't skip any stitches or get a bit chewed up. As you continue sewing the paper will just fall out the back of the machine and leave you to stitch along your merry way. I don't like to backstitch on top stitching so tend to use my locking stitch. See here for how to do this. Once you've top stitched all the way around then press again to set your stitches and make it look all pretty.